Except, that phrase isn’t quite true. As my colleague Kevin Fitchard wrote last week, there’s only one iPad Air model with LTE for all carriers. Apple was able to accomplish an incredible engineering feat by adding support for 14 LTE bands in one single device. And the devices aren’t subsidized or bought on contract, so they’re not locked to carriers because they’re not subsidized by carriers. So what’s the deal? Will your iPad only work on the carrier you choose or not? Out of the box, the statement is correct. There aren’t different iPad Air LTE models for different carriers, but if you choose an LTE carrier at time of purchase, your iPad Air comes with a SIM from that carrier. But after that, you can play the field. I verified this with Apple directly last week and again at my local Apple Store on Friday morning. And then I tested it out in a limited fashion. This morning, I bought a 32 GB iPad Air with LTE for T-Mobile(s tmus). A T-Mobile nano SIM was already inside the iPad. When I got home, I activated the iPad Air on T-Mobile’s network to start my free 200 MB per month service. I’ll add more if needed. The process went without a hitch. I then removed the AT&T(s t) nano SIM from my unlocked iPhone 5s as well as the T-Mobile nano SIM from the new iPad Air. I placed the AT&T SIM in the Air and after a few seconds of searching the iPad found AT&T’s LTE network and I began to surf the web. It’s not a perfect test because in a real world situation I’d be using a data only SIM card from AT&T in the iPad Air. Still, between the test and the fact that there’s really only one iPad Air model with LTE, it shows that this new iPad brings more freedom than prior models. The whole idea behind the multiband support here is for Apple to have one single iPad Air that covers most LTE networks. That’s a cost savings for Apple but it’s also a benefit to consumers who buy the LTE models of Apple’s tablet. If I’m traveling to an area with limited T-Mobile coverage, for example, I can get a SIM from a different carrier — one with better coverage where I’m heading — and use it in my iPad Air during the trip. If we ever witness a data price war, this could come in handy as well: Just get a SIM from the then-lowest priced carrier for data. When discussing this with Kevin Fitchard, he raised a good point: It may be more difficult to do with an iPad that comes with a SIM from Verizon(s vz)(s vod) or Sprint(s s). Moving from either of them to GSM carriers — AT&T or T-Mobile — could prove troublesome. If I could test that I would, but for now, I’ll have to assume that Apple’s information is correct: You can swap out SIMs and use any supported carrier here in the U.S. or abroad as needed for a weekly or monthly amount of data, depending on the operators available plans. This approach also portends a very interesting potential future for smartphones. Once we move to Voice over LTE, or VoLTE, for all voice services, everything is data. And that means if the devices have radios to support most or all LTE bands, consumers could gain tremendous flexibility in choosing which network to use for their phones. Instead of using the same carrier for a year or two, you could theoretically swap out SIMs on monthly basis due to coverage needs or cost savings. Beware AT&T. They sweep their databases for IMEI’s that don’t match with current contracts. An AT&T SIM in an unlocked non-AT&T device can work one day and be blocked the next. When you call them to fix it they will tell you to read the fine print of your service plan and see that they reserve the right to control which devices connect to their network. can’t you buy it without a provider sim? i live in The Netherlands and go to the US these days. Can i buy one and activate it in The Nederlands on my own Vodafone network? Do I need to activate with Sprint first and get it unlocked to be used outside the US, or I can simply remove the Sprint SIM (without even activating) and replace with my other(foreign) nano-SIM? 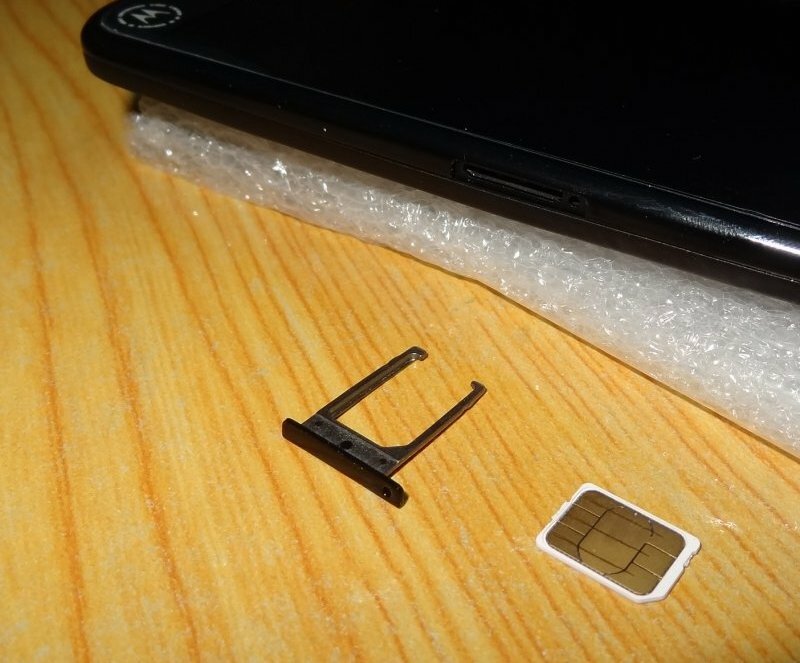 You don’t need to activate Sprint SIM; Just insert your other (foreign) nano-sim. This sort of works. I bought an AT&T iPad Air and was told by the Apple salesman (the store manager, actually) that I could switch carriers afterwards. 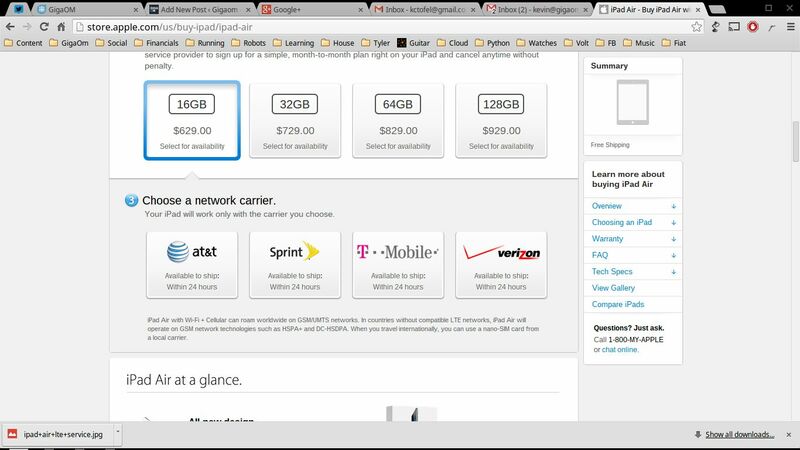 So after realizing that AT&T doesn’t offer iPad tethering (WTF?) I go to Verizon to get a SIM. â€œCome back with the device.â€ Okay, I come back with the device. I go through the setup process and am then told, â€œSorry, this IMEI corresponds to AT&T. Even though your device is unlocked, we will not let you use a Verizon SIM with it.â€ Wot wot? True story. Hi. Considering buying ATT iPad Air for the pay by the month cellular option. But want to be able to also take advantage of the t-mobile 200mb free data via LTE. Both reps from t-mo and apple today were not free about saying that was possible, unlike the article said of apple above. So I’m nervous about sticking myself with ATT only. Would feel better if I saw the Air’s nano sim slot – can anyone post a photo? And a little hint at physically how one switches the card? ok, so i want to buy ipad air with cellular in the US, but i will use it mostly in Poland. Will every ipad work, or should I choose specified model as it was with ipad 4? if i buy an ipad air wifi cellular in the us can i use it in europe ? I’ve heard that the cellular doesn’t work in the europe . and now i don’t know if i should buy it . if i buy a ipad air wifi cellular in the us and bring it to europe can i use the cellular with an european provider ? So I have the grandfathered data plan on my iPhone 5. Can I use the sim card from my iPhone 5 in any of the iPad Air models? or must I stick with T-Mobile or AT&T (since those are GSM and not CDMA)? T-Mobile to Verizon is not working for me. I called the apple store and they said it is locked. The Verizon rep I spoke with said it is locked to T-mobile. Disappointed. I’m headed back to the store to swap for one ready to use with Verizon. Verizon tech support worked on it for 30-40 minutes and couldn’t get the ICCID # to pair up with the IMEI id…and their advice? Return it to Apple and get a Verizon version. Ugh. It’s not like you can find ANY availability right now. I just cut the SIM from my Verizon ipad3 and put it it my new ATT ipad mini retina It’s doing fine with the LTE coverage I get at home. I am not sure what happens when I am in 3G or lower areas. I haven’t activated the ATT sim that came with the device yet. Anyone got the low down in Japan? I just successfully put an ATT sim in a “verizon” ipad air. The LTE and 4g seem to work fine. I had second thoughts just after placing the order with apple. has anyone tried this with the 5c or 5s? I used Verizon for my cell service but intend to take advantage of T-Mobile’s 200MB of free data for my new iPad Air. If there’s some catch to the free data plan or they stop offering it, I might add my iPad to my Verizon account. Should I buy a T-Mobile or Verizon version of the new iPad? I think that boils down to, how much is a SIM card from the other? I.e. if it is $50 from Verizon and $0 from T-Mobile, maybe I should get the Verizon version (with SIM included) and just pick up a SIM from T-Mobile. I do know that I’ll definitely use T-Mobile, but if a Verizon SIM will be really expensive unless I get a Verizon iPad, then maybe I should get the Verizon version. Ok, so I just got off the phone with T-mobile, I told them that I bought an Verizon iPad air (which isn’t true), and that I was interested in acquiring a sim card, they said no problem! BUT! When I asked if I could access the free 200mb with that card they said no, I have to use the card that come in the iPad to be able to access the free 200mb! What does that card have that makes it so magical? or is it bull? He didn’t seem to know very much…I can see people trying to sell their iPad tmobile cards for a few extra bucks if they do have something special, which I doubt… Oh! and by the way they told me that today was the last day that they would offer sim cards for .99 supposedly so they are catching on to this…. What to do!? I want a verizon iPad but want to be able to put in a T-mobile card to get the free 200mb or my att card and be able to use LTE for everything, plus use the verizon one when I need to do tethering, since I have an unlimited att plan the bastards don’t let me do tethering! has anyone tried a sprint ipad sim in a non sprint ipad? I tried a Sprint iPhone 5 SIM in a T-Mobile iPad. I received a SIM not Valid error. I tried. That won’t work. Thanks for the heads up. I wonder if the same is true of the new iPad mini. If so, I’m almost tempted to sell my iPad 3 and get an iPad mini with cellular just for the GPS and access to T-Mobile’s free data. Are there any rumors that T-Mobile’s limited-sip free data plan might be extended to smartphones, including iPhones? A cross-country move meant that I shifted from T-Mobile prepay to AT&Ts to get better local coverage. But if T-Mobile came with even a little free data, I might be willing to live with those fewer bars. So much in the cellular market is bad, organized for cellular companies rather than consumers, that it’s great that new multi-band chips, LTE standards and a SIM for everyone’s system is moving us rapidly toward one-device works everywhere. That means more competition and that’s good. Well, that’s kind of a dumb test since they are all GSM. Going CDMA to GSM is the real test and you “decided” not to test the real thing?? A “Verizon iPad” works just fine with a T-Mobile SIM. Are you satisfied? We now know that LTE will work , but what about where there is not LTE service…for example if one has purchased a the Tmobile LTE iPad , and one swaps the ATT sim into it…will it work on Att 3G incase there is not ATT LTE in the area ? Is your 20GB plan for a mifi hotspot? And if it is, can you easily swap your sim card from your hotspot to your ipad without any glitches? I just bought a T Mobile iPad Air and have cell service through AT&T. How did you get it to work for you? Did you just pop in your AT&T SIM and the iPad recognized the SIM automatically? Yes, that’s all you need to do. The iPad is SIM unlocked and supports all carrier frequencies for LTE to the best I can tell. I have a grandfathered unlimited data plan from AT&T on my iPhone 5s and a t-mob ipad air. I tried doing the same thing as you, I inserted my iPhone sim into the iPad air. However, I was only able to get 4g data after changing my APN settings via unlockit.co.nz. LTE did show up after using it for some time, but it didn’t always. If I just try to simply swap, the sim will register but it will complain about setting up an account and the signal didn’t hold. Did you have to change you APN settings? What kind of data plan do you have on your iPhone? Same, my iPad mini with retina on T-Mobile does not work with my AT&T sim card UNLESS I install the custom APN settings from unlock it.co.nz … How did yours work by just putting the AT&T sim card in? The APN settings disappear when I put in my AT&T sim card. Are you trying to swap the SIMs between an ipad and an iphone like Mlt? Is that what causes the complication and need for unlockif? Let’s see what happens. I’m restoring an AT&T LTE model right now. I also have a Verizon LTE SIM. Alee, Why do you have to restore? Is that required in addition to physically switching SIM cards? Restoring from backup… because the iPad had nothing on it when you first open the box. Update: AT&T iPad will take a VZW SIM and will pick up VZW CDMA and LTE. Good to go… 1 iPad, LTE on any carrier. I also was able to do this with my Verizon iPad 4 no problem. T-Mobile SIM worked just fine (of course only on 2G, or 3G in a refarmed market). I just got my Verizon iPad Air today, I want to test it out with my T-Mobile broadband SIM. My only hesitation is I had previously chopped my TMO SIM down to Nano, then got TMO to replace it with a Micro (to use in my Nexus 7 2013). I’m loathe to chop it down to a nano AGAIN just to test this! I know I can just use the TMO nano SIM in the Nexus with an adaptor, but I’m wary of those, ever since I basically broke the SIM card slot in a cellular Galaxy Note 8.0 by using a nano-SIM with micro adaptor. The SIM got physically stuck in, and I destroyed some contacts in the slot when I tried prying it out. Thankfully I was able to find a replacement SIM card slot module and replace it myself. Not fun or easy…..
Technically this was possible with the Verizon iPad 4 as well. I put an AT&T sim in it from time to time. The key restriction after picking a carrier is that you can only use the on device carrier setup with the carrier you picked. 1. Setup can take place anywhere with primary carrier. If you are out on road and need a quick connect, just go to Settings and setup. Other carrier SIMs have to be setup in store. 2. In store carrier SIMs sometimes have extra costs. For example, the 5GB plan on Verizon cost me exactly $50 on the device, but when I went into the store there was an activation fee and misc taxes/fees. The result is the 1st month for the same plan was nearly double the cost. They reasoning was that it was a post-paid account vs a prepaid account, but it did not make it hurt any less. I am a former Verizon Wireless employee. All Verizon Wireless 4G LTE devices must be factory unlocked per FCC regulation of the band that Verizon is using. Verizon’s primary LTE band is band 13 which is the 700MHz C Block (upper 700MHz frequencies). The FCC has stated a while ago that any carrier that uses band 13 radio waves are not allowed to limit the consumer use of the device to an extent. This is great for consumers, as it bars the carriers from placing strict limitations on how you can and cannot use your device. I know for a fact that this law applies to all US carriers, however I am not sure if this law applies to the manufactures as well in a sense. For example, Verizon must factory unlock all LTE devices due to them using band 13. However, I am not sure if certain devices from AT&T, Sprint, and T-mobile must follow the law as well just because those few select devices are capable of using Band 13 as well like the iPhone 5s for example. AT&T, Sprint, and T-mobile does not use Band 13 for any network, but some of their devices are capable of using the band though. So to sum it up, a 3rd Gen and 4th Gen Verizon iPad will be unlocked and work on AT&T and T-mobile perfectly fine with small limitations, but the same type of device in opposite roles would be locked to their carrier.